Black Panther has been a lively topic of conversation for a bit longer now than most Marvel movies manage to be, and in wider circles. It owes a lot of that to its thoughtful take on producing politically relevant themes and pushing discussions about the worldwide black experience. Now, one teacher in Chicago is using that as a springboard for an entire lesson plan. Tess Raser, a teacher of sixth graders at the Dulles School of Excellence in Chicago, has built the “Wakanda Curriculum” to drive discussions in advance of and after viewing of Black Panther. As Blavity reports, Raser was inspired after her own conversations about the film to take those debates—about black revolution, black feminism, and the legacy of colonialism and anti-black racism—to her students. The result is a lesson plan, now available online, that brings those conversations into the classroom. “I loved the movie but left with critiques as well, and spent most of the weekend engaging in conversations in regards to those critiques and my friends’ analysis of the film and its characters. I was excited thinking about my students having those conversations as well,” Rasser told Blavity. 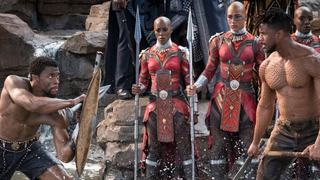 For Rasser, Black Panther was the perfect flashpoint, both as an opportunity to reflect on the past and imagine a future inspired by Wakanda’s black utopianism and Afrofuturism. The cirriculum, she said, was designed for her sixth graders, but could be used for high schoolers as well. And, frankly, these are conversations we could all stand to take part in.